Escalators are a consistent speed – people get on in a certain order and their arrival time and order sequence is predictable. Elevators are much more random, we don’t know when the door will open, or how long it will take to arrive at its destination, or even the route it will take. The order passengers/packets disembark is unrelated to the order they boarded. For all of these reasons, voice has traditionally worked best on escalators. But technology improvements allow voice to work on elevators, effectively the elevators are so fast now that the passengers can arrive, and re-sort themselves in proper order in the same amount of time the escalator took. Got it? Yes, I know there are holes in this comparison- sometimes people on escalators manage to change their sequence, and so on, but as a teaching metaphor it works pretty well. For InterOp New York, I stayed at the Marriott Marquis hotel on Times Square. A wonderful hotel that I am happy to recommend. The building has lots of elevators, I think twelve, and they are highly unusual -in fact, I’ve never seen this before. Instead of the standard up and down call buttons, the wall has a full keyboard. 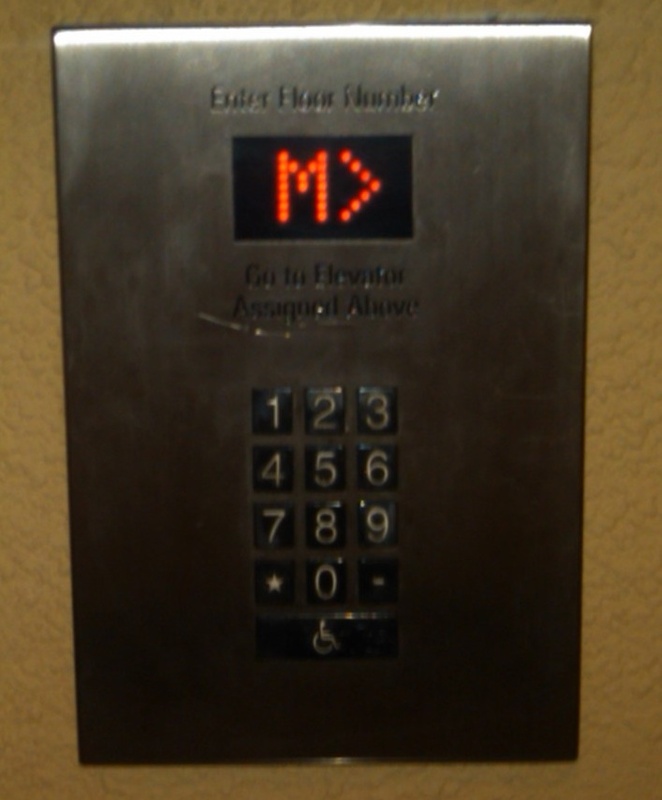 You enter the destination floor, and it displays the elevator to take by its letter. Proceed to that elevator location and when it arrives, it already knows where to go. The elevator itself has only a few basic operational keys (door open), the floor keys aren’t there. There is a small display that indicates the floors where it intends to stop, and sure enough my destination was always displayed. I don’t know the extent of the software that drives these elevators, but it sure seemed like a layer 3 elevator implementation. The keypad was “routing” me/the packet to the most efficient elevator. Most elevators are pretty dumb. All they know is the general direction I want, and if it is heading that way it will offer a ride. But that really isn’t very efficient. It would be much better to know the actual destination. If several people are headed to floor 33, and several people are headed to floor 41, it would make sense to route them to two different elevators. It’s a pain when a crowded elevator stops on every floor. With 12 elevators at your disposal, it would be more effective to route than be subject to so much congestion delay. Many buildings attempt this by allocating express elevators, or limiting elevator service to specific floors – but that doesn’t dynamically adjust to the presented demand. These layer 3 elevators have the potential to dynamically route and load balance. Evidently, these elevators were installed in 2005, and are becoming the norm for sky scrapers. Thanks to Google, I have learned that they are made by Schindler Elevator Corporation, and known as the Miconic 10 “smart elevators”. They claim to improve elevator operations by 50%, and the story with the Marquis is the waits were becoming unbearable as Times Square transitioned from a slum to tourist mecca. Adding new elevators wasn’t an option for such a tall building, so instead they had to improve operations. In other words, when basic switching gets too congested, it’s time to insert a router.